It’s been raining a lot lately, so we thought that it’s best to hide in some wooden cabin in a forest and forget about everything. 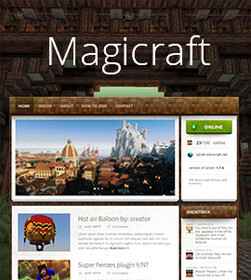 It’s 100% bio and natural skin that you can get for FREE for your Magicraft site. If you are interested how Wooden was made and how you can make your custom skin, then check out the latest guide. Also if you are not sure how to add a new skin, just follow this guide, it’s really easy.